So another year, another Eagle Gallery themed show:- “Environmental”. I must confess I struggled to come up with an idea that was more than just an Urban or Rural landscape. The subject felt political somehow and therefore deserving of comment through the piece in some way. I considered something involving a power station spewing smoke into the air, or a still life of some waste plastic bottles but again it wasn’t actively saying much. It was my wife that came up with the idea – and instantly I thought ‘yes that’s the solution’. And here’s the rub. From my perspective, this is just a statement of fact with no malice intended. I feel certain that many a domestic dispute can erupt around these issues. 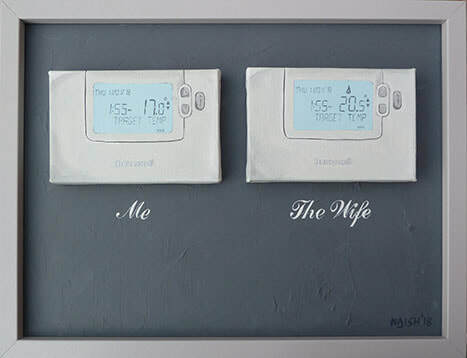 The reality is that I accept that my wife likes it warmer and that I’ll have the temperature down a bit when I’m on my own. It’s no big deal. Well we will present it to the world in February and see what (if any) the reaction is. Incidentally the wife laughed when she saw it – so job done I guess.